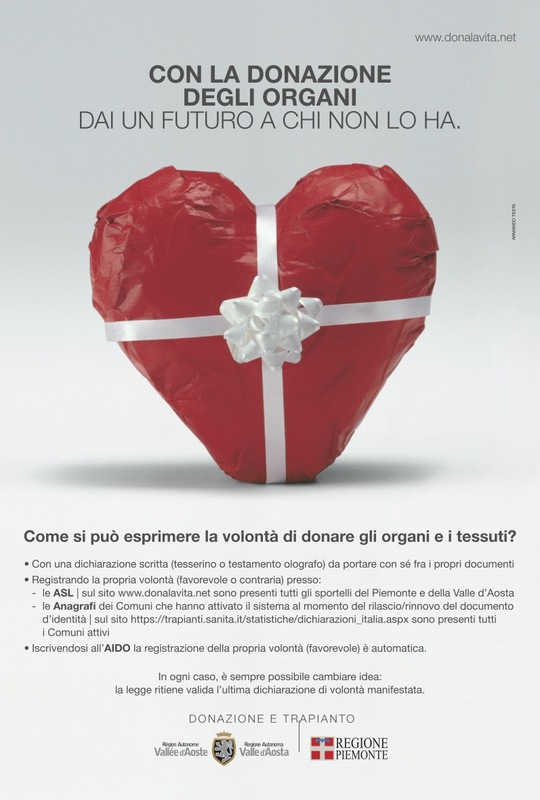 ARMANDO TESTA IS PROMOTING THE ORGAN DONATION CAMPAIGN IN PIEDMONT AND VALLE D'AOSTA. "By donating your organs you give a future to those who don’t have one" is the headline of the non-profit press ad created and produced by the Armando Testa agency. This phrase makes us stop and think because during our life we ​​are all potential donors, but also potential recipients. The message is easy to understand and to share, and it is combined with the image of a heart wrapped up as a gift - symbol of the Donation and Transplant programme of the Piedmont Region and Valle D'Aosta. The aim is to emphasise both the ethical aspect and goodness of making a donation. So giving hope to those who are suffering is the fundamental concept that the Armando Testa agency wants to express. The agency has always been very sensitive to problems and social issues and makes an enthusiastic and professional front line commitment to developing and creating numerous non-profit campaigns. The campaign is also an open invitation to raise awareness and let citizens know how simple it is to express their desire to donate their organs and tissue. You can do it with a written declaration that you can carry with your personal documents. Or by registering your desire at the local ASL, the Municipal Registry offices where a system has been activated the system or by joining AIDO. The campaign is running in the local editions of main newspapers in September, October and November.